Open Air Mining Case 6 GPU Computer ETH Miner Frame Rig 6 Fans with Temp Monitor. No computer hardware is included, you need to get your own motherboard, memory, PSU, CPU and GPUs. Stackable open air design, perfect for any type of GPU scrypt mining such as Litecoin, Dogecoin, Earthcoin, etc. Also great for Bitcoin ASICs. Keep your video cards extra cool with this open air design. Plenty of room between cards allow airflow. This is the luxury version you will get 6 fans(3 rear and 3 front) along with the temperature monitoring kit. Holds: 6pcs graphics (video) cards. Holds: 1pcs 3.5" hard drive or 1pcs 2.5" hard drive. Temperature monitoring LCD panel included. Dimension(LWH): 19x16.5x15 inch. 1x ETH Miner Kit Unassembled. 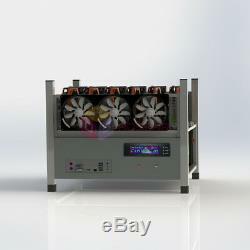 6 Cooling Fan with temperature monitoring version. China to United States, by ePacket. China to Other Countries, by. The item "Open Air Mining Case 6 GPU Computer ETH Miner Frame Rig 6 Fans with Temp Monitor" is in sale since Wednesday, July 26, 2017. This item is in the category "Computers/Tablets & Networking\Computer Components & Parts\Computer Cases & Accessories\Computer Cases". The seller is "aos_store2015" and is located in GZ.